Today I had a few hours free, and was wondering how to spend them. Defrosting and wiping down the freezer? Scrubbing the grungy floor of the porch? But I realized that what I actually wanted to do was spend the next few hours doing something that would make me really happy. And I realized, after thinking over the options, that what would make me really happy would be finding some sort of box to store all of our family’s winter boots during the summer. So, with a Passover class playing in my ear and the scent of Jerusalem orange blossoms filling my nostrils, I marched off to my favorite Home-Depot-type store, which was already crowded with Jewish women buying colorful plastic tablecloths and wallpaper and oven mits. I asked the owner if she had a big box. For boots. And she guided me over the shoe storage section. All sorts of cloth boxes sectioned off to hold pairs of shoes. One kind fit under a bed. One kind hangs over a door. 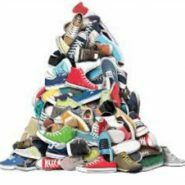 There are ten of us Weisbergs (b”H) each of us has several pairs of shoes (b”H)–running shoes, sandals, Shabbat shoes, winter boots, slippers. I’ll let you do the math, but that’s a LOT OF SHOES! Concentrated in tumultuous mountains around our home. With, like Orphan Annie, no real place to call home. And all of a sudden, looking over these shoe storage options, I imagined a new reality in my home. Shoes hung up in neat little pockets behind a bedroom or closet door. And I felt, well, EXCITED! On the light rail home, I thought of what an interesting religion Judaism is. So many of our holidays center around doing unusual things to our homes. On Chanukah, we Jews fill our homes with candles. On Succot, we Jews move into our back yards or our porches. On Pesach, we Jews cover our kitchens with tinfoil and rid our homes of leaven. Isn’t it interesting, I thought… So many people around the world enjoy the excitement of visiting other countries, other cities. And we Jews also like to travel, to go somewhere new. But for us, it can be just as exciting to follow our ancient laws that show us how to stay home, and still go somewhere new. Chana,you have a knack of revealing profound truths in everyday occurrences. This is Judaism: Finding the holy within the mundane,raisng the objects in your environment as an offering to Hashem, fusing together the material and the spiritual. because the center of Judaism is the home. This post was wonderful and encouraging for me. Due to circumstances beyond my control, I had to cancel a trip that I was going on today. At first I was disappointed, but after reading this I feel inspired to look for the good where I am today and to continue with my Cleaning for Pesach!! Thank you for the reminder! Also, just what I needed to hear today!